Early confirmation of endotracheal tube placement is of paramount importance to prevent hypoxia and its catastrophic consequences. Despite certain limitations, capnography is considered the gold standard to evaluate the proper placement of an endotracheal tube. Ultrasound is a novel tool with some definitive advantages over capnography. It enables a real-time view and can be performed quickly; furthermore, it is independent of pulmonary blood flow and does not require lung ventilation. In this review, we aimed to evaluate the diagnostic accuracy of transtracheal ultrasound in detecting endotracheal intubation. We completed an extensive search of MEDLINE®, EMBASE™, The Cochrane Library, KoreaMed, LILACS, OpenGrey, and the World Health Organization International Clinical Trials Registry from their inception to September 4, 2014. The studies that met the inclusion criteria were pooled and a meta-analysis was conducted. Eleven studies and 969 intubations were included in the final analysis. Eight studies and 713 intubations were performed in emergency situations and the others were carried out in elective situations. Transtracheal ultrasonography’s pooled sensitivity and specificity with 95% confidence intervals (CIs) were 0.98 (95% CI 0.97 to 0.99) and 0.98 (95% CI 0.95 to 0.99), respectively. In emergency scenarios, transtracheal ultrasonography showed an aggregate sensitivity and specificity of 0.98 (95% CI 0.97 to 0.99) and 0.94 (95% CI 0.86 to 0.98), respectively. Transtracheal ultrasound is a useful tool to confirm endotracheal intubation with an acceptable degree of sensitivity and specificity. It can be used in emergency situations as a preliminary test before final confirmation by capnography. Saurabh Kumar Das and Nang Sujali Choupoo are responsible for the integrity of this work from inception to manuscript preparation. They contributed to the study design, study selection, quality assessment, records review, data synthesis, data analysis, and manuscript composition. Rudrashish Haldar and Amitabh Lahkar contributed to the review process by searching the literature and reviewing the search records and manuscripts. All authors read the final manuscript. The online version of this article (doi: 10.1007/s12630-014-0301-z) contains supplementary material, which is available to authorized users. La confirmation rapide du positionnement du tube endotrachéal est d’une importance capitale pour prévenir l’hypoxie et ses conséquences catastrophiques. En dépit de certaines limites, on considère que la capnographie constitue la référence universelle permettant d’évaluer un bon positionnement du tube endotrachéal. L’échographie est un nouvel outil qui offre des avantages certains par rapport à la capnographie. Elle permet une vue en temps réel et peut être réalisée rapidement; en outre, elle est indépendante du débit sanguin pulmonaire et ne nécessite pas de ventilation pulmonaire. Au cours de cette étude, nous avons cherché à évaluer la précision diagnostique de l’échographie transtrachéale pour la détection de l’intubation endotrachéale. Nous avons mené une recherche extensive dans les bases de données MEDLINE®, EMBASE™, The Cochrane Library, KoreaMed, LILACS, OpenGrey, ainsi que dans le Registre des essais cliniques internationaux de l’Organisation mondiale de la santé depuis leur création jusqu’au 4 septembre 2014. Les études répondent aux critères d’inclusion ont été regroupées pour permettre la réalisation d’une méta-analyse. Onze études et 969 intubations ont été incluses dans l’analyse finale. Huit études et 713 intubations ont été pratiquées dans des situations d’urgence et les autres ont été réalisées dans des situations programmées. Après regroupement, la sensibilité et la spécificité de l’échographie transtrachéale, avec intervalles de confiance (IC) à 95 %, ont été respectivement de 0,98 (IC à 95 %: 0,97 à 0,99) et 0,98 (IC à 95 %: 0,95 à 0,99). Dans les situations d’urgence, la sensibilité et la spécificité groupées de l’échographie transtrachéale ont été, respectivement, de 0,98 (IC à 95 %: 0,97 à 0,99) et 0,94 (IC à 95 %: 0,86 à 0,98). L’échographie transtrachéale est un outil utile pour confirmer l’intubation endotrachéale avec des niveaux de sensibilité et de spécificité acceptables. Elle peut être utilisée dans les situations d’urgence comme test préliminaire avant une confirmation définitive par la capnographie. Confirmation of the proper placement of an endotracheal tube (ETT) is a crucial step in airway management since unrecognized esophageal intubation leads to catastrophic consequences. Numerous methods are used to verify ETT placement, including visual confirmation of the ETT passing through the vocal cords during laryngoscopy, expansion of the chest wall during ventilation, visualization of the tracheal rings and carina using a flexible bronchoscope, auscultation, capnometry, capnography, and chest x-ray. These techniques vary in their degree of accuracy.1,2 The 2010 - Advanced Cardiac Life Support guidelines recommend the use of quantitative waveform capnography to confirm ETT placement and to check the effectiveness of chest compression.3,4 Although, capnography is considered the gold standard to confirm tracheal intubation, it has some major limitations. First, detection of carbon dioxide by capnography depends on adequate pulmonary blood flow; thus, its accuracy may be compromised in patients with massive pulmonary embolism and those suffering from cardiac arrest (especially where cardiopulmonary resuscitation has not yet started or the patient is in a state of cardiac arrest for a prolonged period).5 Second, respiration must be maintained for several breaths to accurately confirm the ETT placement. A trauma victim is usually considered to have a full stomach unless it is proven otherwise, and inadvertently ventilating the stomach of such a patient with a misplaced ETT can cause gastric distension, vomiting, and aspiration.6-8 Third, capnography may provide false negative results in cases of airway obstruction or due to the use of epinephrine.9,10 Thus, in the face of various limitations of the techniques currently used to verify ETT placement, there is need for a consistently reliable and safe technique that can be used in real time without ventilating the lungs. Ultrasound, once the domain of the radiologist, has now found its place in pre-hospital applications (e.g., emergency responders), emergency wards, intensive care units, and operation theatres. Portable ultrasound is easy to carry, non-invasive, relatively economical, easily reproducible, and widely available, and it has a good safety record.11 Various studies have shown that ultrasound is a novel tool to confirm proper ETT placement.12-19 Confirmation with ultrasound is a potential alternative when detection of CO2 by capnography is compromised, where capnography is not available, or as an adjunct to capnography. In recent years, an increasing number of original research publications have evaluated the accuracy of ultrasound for confirming ETT intubation and have reported high sensitivity and specificity using this technique.6,7,12-19 Two previous attempts were made to address this important clinical issue, one in 2011 in the form of a systematic review and one in 2012 in the form of a systematic review with a meta-analysis.20,21 Both reviews were presented during conferences, but the full texts were not published in any scientific journal. While one study did not report aggregate sensitivity or specificity, the other included only 323 intubations. After 2012, several high-quality studies were conducted, which encouraged us to undertake this systematic review and meta-analysis to test the accuracy of transtracheal ultrasound in detecting ETT intubation. Unlike the previous reviews, which included both transthoracic and transtracheal ultrasound, the focus of our novel review is on transtracheal ultrasound alone. On September 4, 2014, we performed a search of the published research evaluating the diagnostic accuracy of ultrasound. We searched for published literature in the English language in MEDLINE® via PubMed, EMBASE™ via Ovid, The Cochrane Library, and Trip database. For literature published in other languages, we searched KoreaMed and LILACS, and we searched OpenGrey (www.opengrey.eu/) and the World Health Organization Clinical Trials Registry (who.int/ictrp) for unpublished literature and ongoing studies. Details of our search strategy are shown in the Appendix (available as Electronic Supplementary Material). New links displayed alongside the abstracts were followed and retrieved, and the bibliographies in the retrieved articles were searched independently and checked for additional studies. The authors of the articles were contacted where there was any confusion regarding the reported data. Studies using transtracheal ultrasound to verify the ETT position following an emergency or elective intubation were included in this meta-analysis. The ultrasound examination was done by placing a linear or curvilinear probe on the cricothyroid membrane or just above the suprasternal notch. Probe placement was either transverse or horizontal. The ultrasound examination was performed simultaneously with intubation or just afterward. A transverse view at the level of the cricothyroid membrane identified the ETT placement during the process of intubation by the characteristic “snowstorm sign”, “bullet sign”, or a flutter behind the thyroid cartilage.22,23 Upon completion of intubation, ETT intubation was identified by one air-mucosa (A-M) interface with posterior shadowing (comet-tail appearance). Two air-mucosa interfaces with posterior shadowing (double-track) indicated esophageal intubation13,14 (Fig. 1). Shows one air-mucosa interface with comet-tail artifact for tracheal intubation and two air-mucosa interfaces with comet-tail artifact or double-track sign for esophageal intubation. Republished with permission from American Institute of Ultrasound in Medicine (AIUM) from Use of sonography for rapid identification of esophageal and tracheal intubation in adult patients. Bunyamin Muslu, Hüseyin Sert, Ahmet Kaya, Rüveyda Irem Demircioglu, Muhammet Gözdemir, Brrhanettin Usta, Kadriye Serife Boynuklam, 2011;7 permission conveyed through Copyright Clearance Center, Inc.
Studies that evaluated the diagnostic accuracy of transtracheal ultrasound in confirming ETT intubation. Studies that verified the result of the index test (ultrasonography) with that of a gold standard (capnography). Studies that evaluated the accuracy of ultrasound in living adult humans (i.e., studies on cadavers and neonates were excluded). Two authors (S.D. and S.C.) and one subject expert (D.P., not an author) independently reviewed the articles, performed a quality assessment, and ascertained the criteria for inclusion in the pooled data analysis. Any disagreement was resolved by consensus. Articles by the same author(s) were carefully investigated to avoid duplication of studies. We arranged the data in 2 × 2 tables expressing true positive, false positive, false negative, and true negative. In the primary studies where data were not expressed in contingency tables, we reconstructed 2 × 2 tables from the number of ETT and esophageal intubations. We constructed the forest plots with freeware Meta-DiSc, version 1.4 software (http://www.hrc.es/investigacion/metadisc-en.htm; Ramon y Cajal Hospital; Madrid, Spain).26 Pooled sensitivity and specificity and their corresponding 95% confidence intervals (CIs) were obtained. To test for heterogeneity among various studies, eyeball tests and the (Cochran Q) were performed. A P value of < 0.10 indicated significant heterogeneity. Meta-DiSc computes the inconsistency index (I2), which has been proposed as a measure to quantify the amount of heterogeneity. Inconsistency (I2) describes the percentage of total variation across studies that are due to heterogeneity rather than due to chance. The I2 can be readily calculated from basic results obtained from a typical meta-analysis as I2 = 100%(Q − df)/Q, where Q is Cochran’s heterogeneity and df is the degree of freedom. Cochran’s Q is computed by summing the squared deviations of each study’s estimate from the overall meta-analytic estimate. 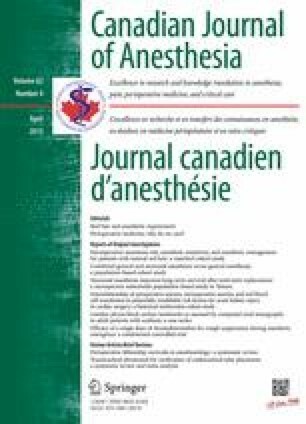 Sensitivity analysis was performed to ascertain the robustness of the result of the review after excluding the studies where intubations were done electively in a controlled environment and studies that had more than one area of high or unclear risk of bias. Another sensitivity analysis was done after excluding studies that did not use one A-M interface with comet-tail or reverberation artifact or similar features for tracheal intubation and those that did not use two A-M interfaces with comet-tail or reverberation artifact or similar features for esophageal intubation. The method of analysis was decided prospectively before commencement of the data search. The review process and selection of included studies are presented in Fig. 2. Twelve studies met the inclusion criteria for the present analysis. Three studies examined the accuracy of ultrasound in elective intubations, whereas the others assessed the accuracy of ultrasound in emergency intubations. In most of the studies, the intubations and ultrasound examinations were performed by the emergency physicians. One study was excluded from the final analysis as it was difficult to compute zero in the contingency table using the meta-analysis software.26 Finally, eleven studies and 969 intubations were analyzed. The following characteristics of the included studies are presented in Table 1: year of publication, country of origin, setting of the study, sample size, sonographic features to distinguish ETT or esophageal intubation, type of probe and its position, ultrasound operator, time taken to complete the ultrasound assessment, and the accuracy of the ultrasound. The quality of the included studies as assessed by QUADAS-2 is presented in Table 2. The majority of the studies had low risk of bias regarding patient selection, index test, reference test, flow & timing, and the applicability of the index and reference tests. The pooled sensitivity and specificity for detection of proper ETT placement with ultrasound were 0.98 (95% CI 0.97 to 0.99) and 0.98 (95% CI 0.95 to 0.99), respectively (Fig. 3). Sensitivity analysis was done after excluding three studies with elective intubations. The aggregate sensitivity and specificity of ultrasound in emergency intubations were 0.98 (95% CI 0.97 to 0.99) and 0.94 (95% CI 0.86 to 0.98), respectively (Fig. 4). The pooled sensitivity and specificity of the studies using one A-M interface with comet-tail artifact and two A-M interfaces with comet-tail artifact or similar features were 0.99 (95% CI 0.98 to 1.00) and 0.97 (95% CI 0.94 to 0.99), respectively (Fig. 5). Pooled sensitivity and specificity of studies with a low risk of bias were 0.98 (95% CI 0.97 to 0.99) and 0.98 (95% CI 0.95 to 1.00), respectively (Fig. 6). The Cochran X2 and the inconsistency index (I2) in the forest plots indicated mild to moderate variation across the studies. The present study showed that ultrasound is a novel tool to confirm ETT intubation with an overall pooled sensitivity and specificity of 98% (95% CI 97 to 99) and 98% (95% CI 95 to 99), respectively. The aggregate sensitivity and specificity of ultrasound in emergency intubations were 98% (95% CI 97 to 99) and 94% (95% CI 86 to 98), respectively (Figs. 3, 4). One meta-analysis of five studies and 323 intubations reported that the pooled sensitivity and specificity of ultrasound were 91% (95% CI 74 to 97) and 97% (95% CI 89 to 99), respectively.20 This difference in accuracy compared with the present study may be attributed to fewer studies and the smaller sample size of the previous study. Another study reported that capnography had 100% sensitivity and specificity in both cardiac arrest and non-arrest patients.1 Based on 2,192 intubations, a meta-analysis of capnography trials resulted in an aggregate sensitivity of 93% (95% CI 92 to 94) and an aggregate specificity of 97% (95% CI 93 to 99) for confirmation of emergency ETT placement.32 The present review showed comparable sensitivity and specificity of ultrasound, although the sample size of the present study was small (2,192 vs 969). Different authors described different sonographic features to diagnose tracheal and esophageal intubation (Table 1), but close examination of the ultrasound images revealed that almost similar features were described differently. Similar sonographic features of tracheal intubation have been described as follows: one A-M interface with comet-tail or reverberation artifact and posterior shadowing, two symmetrical hyperechoic lines on transtracheal ultrasound, hyperechoic shadow or comet sign, and shadowing posterior to the tracheal rings. 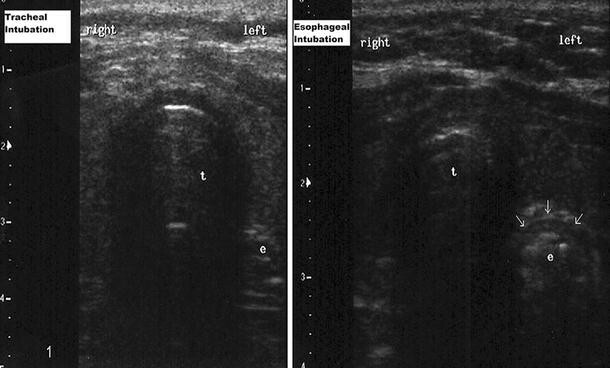 On the other hand, there were similar ultrasound features indicating esophageal intubation: two A-M interfaces with comet-tail or reverberation artifact and posterior shadowing, empty trachea and probe movement demonstrating dilated esophagus, two hyperechoic lines inside the esophagus, opening of the esophagus by the ETT, and shadowing posterior to the tracheal ring and in the left paratracheal space. To date, studies are lacking that directly compare the accuracy of different sonographic features. Sensitivity analysis of the studies using one A-M interface with comet-tail or reverberation artifact and two A-M interfaces with comet-tail or reverberation artifact or similar features showed that the pooled sensitivity and specificity of these signs were 0.99 (95% CI 0.98 to 1.00) and 0.97(95% CI 0.94 to 0.99), respectively (Fig.5). Several studies of transtracheal or transthoracic ultrasound were performed on cadaver or human subjects, and the diagnostic accuracy of the techniques was reported. These studies reported that transtracheal ultrasound had a sensitivity of 95.7-100% and a specificity of 96.3-100%.12,33-37 Transthoracic ultrasound uses either a lung sliding sign or diaphragmatic motion during ventilation to verify the position of the ETT.15-19,38 Reported sensitivities and specificities of these methods were 87-100% and 92-100%, respectively.15-19,38 We limited our review to the studies pertinent to transtracheal ultrasound. The definite advantage of transtracheal over transthoracic ultrasound is that the former does not need ventilation for confirmation; however, the transtracheal method cannot differentiate between tracheal and bronchial intubation. The technique of transtracheal ultrasound to verify ETT placement has potential limitations and pitfalls. The dynamic real-time confirmation approach is potentially challenging because the ultrasound probe is placed at the level of the cricothyroid membrane, and the hand holding the probe lies in the path of the laryngoscope handle during intubation. Moreover, dynamic confirmatory signs, e.g., a brief flutter deep to the thyroid cartilage, can be detected only during real-time monitoring and not after intubation. The ultrasound device cannot be used instantaneously as it requires start up, warm up, and adjustment of the depth and gain settings. Most in-hospital cardiac arrests occur on the ward in the early hours of the morning;41 thus, it is more complex and time consuming than simply applying the probe onto the patient’s skin, particularly in emergency scenarios. A portable ultrasound device is usually equipped with a black and white LCD display. Under daylight, in a pre-hospital setting, the reflection of the sunlight on the LCD screen may make it difficult to view ultrasound images. Moreover, surgical emphysema, difficult neck anatomy, and calcification may obscure the ultrasound image.8,42 Another drawback is the need for a second person to perform the ultrasound examination, which is not always feasible in emergency conditions. The primary method for ETT verification is visualization of the ETT passing through the vocal cords, which is accomplished by direct laryngoscopy or with a video laryngoscope. In view of various technical limitations, confirmation with direct laryngoscopy remains the standard and ultrasound is secondary even in the absence of pulmonary flow during cardiac arrest. This review has some methodological limitations. The total sample size of emergency intubations was small, i.e., eight studies consisting of 713 emergency intubations. The number of esophageal intubations was less than the number of ETT intubations due to a lower incidence rate. We express our sincere gratitude to Dr. Debasis Pradhan for assessing the quality of the included studies. Abbasi S, Farsi D, Zare MA, Hajimohammadi M, Rezai M, Hafezimoghadam P. Direct ultrasound methods: a confirmatory technique for proper endotracheal intubation in the emergency department. Eur J Emerg Med 2014; DOI: 10.1097/MEJ.0000000000000108. Deeks JJ, Wisniewski S, Davenport C. Chapter 4: Guide to the contents of a Cochrane Diagnostic Test Accuracy Protocol. In: Deeks JJ, Bossuyt PM, Gatsonic C (Eds). Cochrane Handbook for Systematic Reviews of Diagnostic Test Accuracy Version 1.0.0. The Cochrane collaboration, 2013. Available from URL: http://srdta.cochrane.org/ (accessed November 2014).